I love chicken noodle soup. My husband loves soup in my Italian bread bowls. 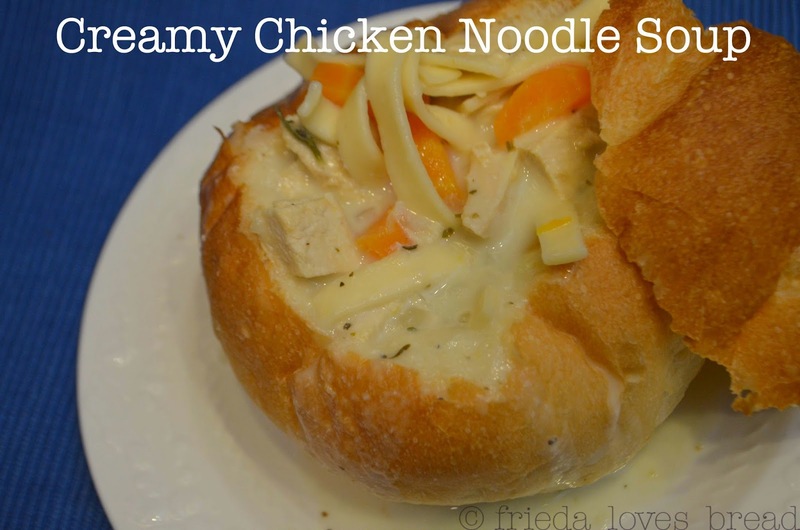 One night, I got a craving not just for chicken noodle soup, but a CREAMY chicken noodle soup, so I hunted the Internet for a recipe. I was disappointed to find the majority of the recipes called for a can of creamed soup. Sure, I have the stuff, but I wanted to make a creamed soup from scratch. Can it be that hard? Apparently, it's not. 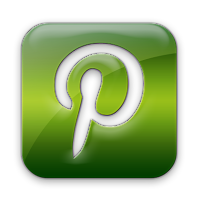 This recipe is adapted from Paula Deen's Lady Chicken Noodle soup. I simplified it and adapted it for my pressure cooker by using boneless skinless chicken and omitting the sherry and mushrooms. 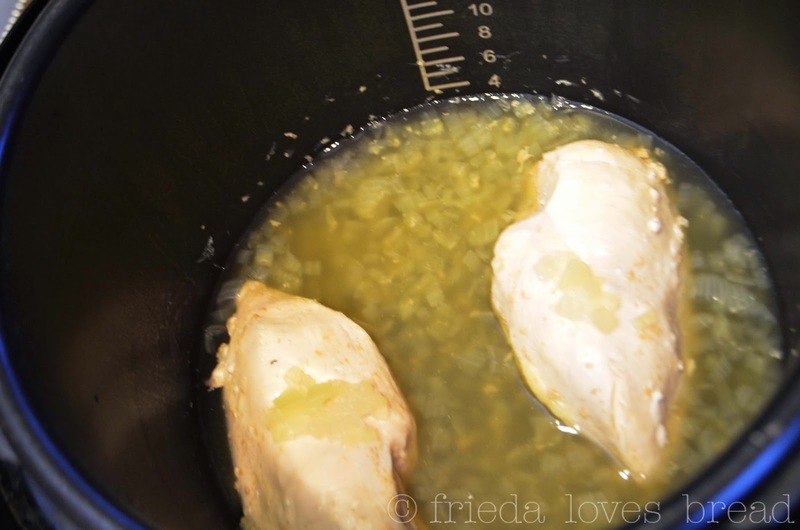 I LOVE using my pressure cooker to put frozen (YES FROZEN) chicken, the broth (water or sauce) to cook it completely. It only takes 9-12 minutes on HI pressure in the pressure cooker, with quick release. I tossed some diced onion with the chicken broth to help flavor the chicken while cooking. I took the chicken out to cool before dicing and put in the rest of the ingredients. Did it work? You betcha! These noodles were perfect! Not mushy and not tough. 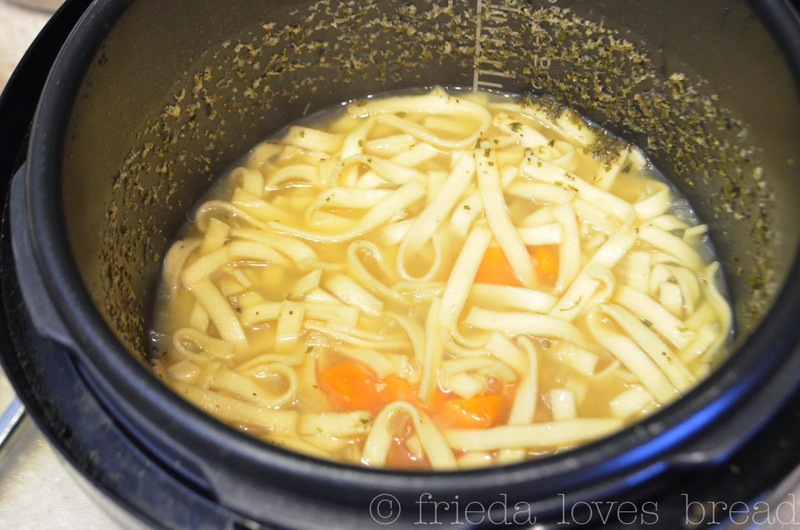 You will NOT be able to cook fresh noodles or very small noodles (orzo) in a pressure cooker. Don't forget to take the bay leaves out... no one wants a surprise in their soup! The flavor of this soup is VERY good: Italian seasoning, lemon pepper, parsley, rosemary, garlic, onion and a couple of bay leaves are all you need. A soup that would normally take 1 1/2 hours or longer to make took less than 45 minutes from start to finish in my pressure cooker. Put chicken in pressure cooker. Pour 1 c. broth and onions on top. Pressure cook on High for 9-12 min, depending on chicken size. Add seasonings, garlic, bay leaves, carrots, celery and noodles. Add 3 cups of chicken broth. 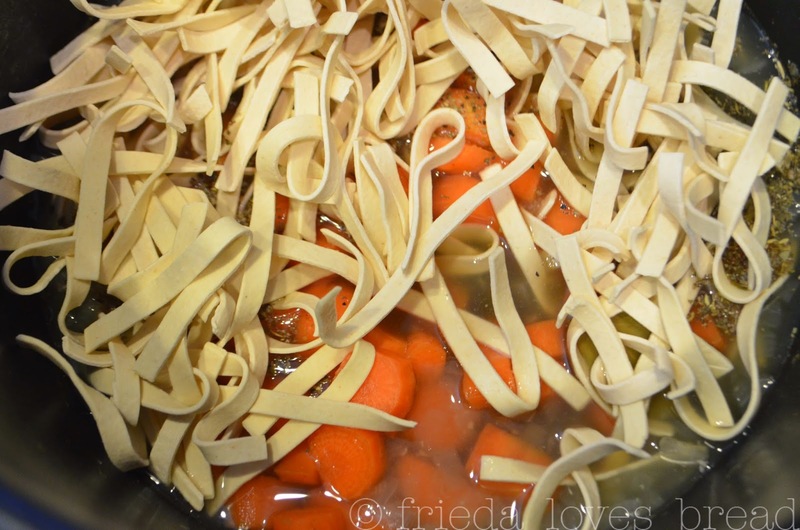 Make sure broth is covering noodles. Pressure cook on High for 6 minutes, with quick release. Dice cooked chicken and return to PC. 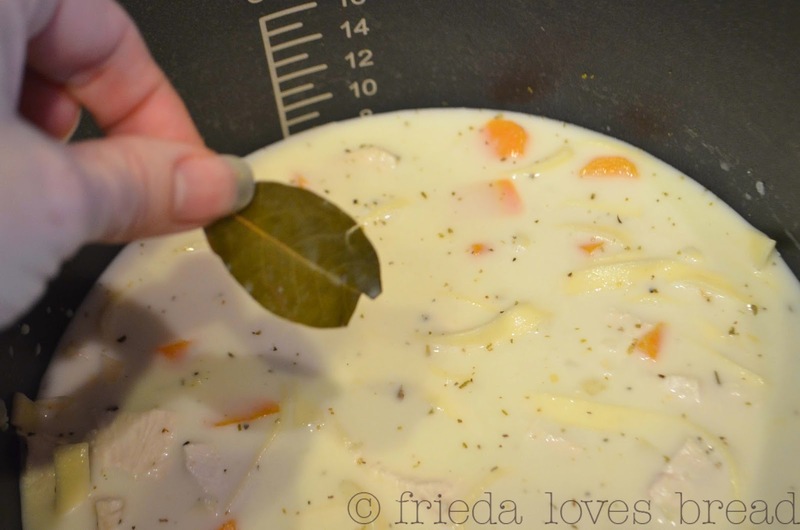 Stir flour into heavy cream and pour in cooked soup. Cook on browning (or saute) setting, stirring, till bubbly.